The Foyle Bridge in Derry. Police have confirmed that searches are still ongoing this evening amid reports that a man was seen entering the River Foyle this morning. The Foyle Bridge was closed in both directions shortly after 11.30am this morning as emergency services were tasked to the scene. The bridge was reopened a short time later, but a major search operation is understood to have been under way on and along the river for several hours. 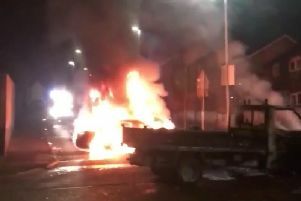 A PSNI spokesman said on Thursday evening: “Police received a report that a person may have went into the River Foyle in Derry on the morning of Thursday, February 2.